Great Whale watching in Spring & Fall! 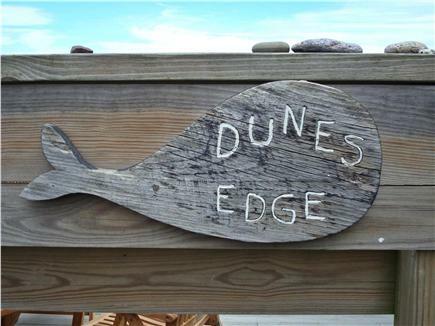 Enjoy the breathtaking views of the Atlantic ocean and national seashore from atop a 20 ft dune. Large decks, fireplace and all the amenities of home. Charming beach house in the National Seashore, private dune just off Ocean View Drive. Great place for swimming, surfing, exploring, reading or just relaxing. Enjoy unobstructed water views from our east-facing, 2,000 square foot, Cape Cod-style, two-level home. Walk or bike to nearby ponds for kayaking & canoeing. Just a short drive or bike into town for the summer concerts, square dancing on the pier, browsing the galleries or just relaxing on your deck. Watch the seals play all summer or the whales migrate in the spring and fall. The kitchen is fully equipped including lobster pot, claw crackers, picks, and butter warmers for your lobster-bake! Wake up to the sunrise & the sound of the surf! This home has great space for family and friends w/ 2 levels of living including a large downstairs family room, perfect for 2 families. Direct access to the dunes outside. Just bring your surfboard, towels & beach chairs & stroll down to the beach! Panoramic, unobstructed views of the Atlantic ocean, beach & dunes of the National Seashore! Linens not provided. Renter must be over 28 yrs of age. Oceanfront and perfect for us! We cannot say enough about how lovely this house is. The beach is a few steps away and in full view. 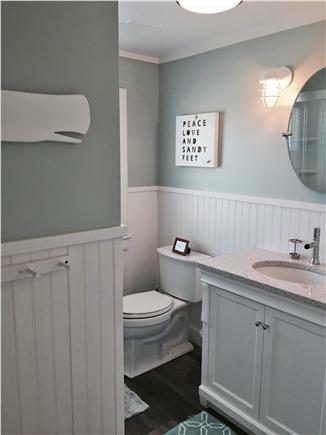 All the modern amenities you'd need, while also feeling very Capey, peaceful and removed. We look forward to our next stay there. We enjoyed our stay at Wellfleet by the Sea. We were 4 couples and loved most the two-minute walk to the beach. It’s a short and fairly easy down-and-up on a sandy trail. There were never any crowds when we were there, though we could see the distant crowd at Maguire’s Landing, the public beach to the south. The youngest couple among us had great fun on boogie boards. The back deck is a perfect shady place to watch the ocean in the afternoon, and the side deck has good sun all day. We all agreed that the beds were comfortable. Although there are beds for 8, eight adults do not fit well. This spot would do best for a group that plans to eat out most nights. For dinners at home, the small kitchen and single refrigerator cannot stand up to most meals at home with occasional lunches out. We should note that we brought lots of foods with us and then did a big shop when we arrived, so we wouldn’t have to run to the store every day. We cooked lobsters three nights, and we were glad we had brought along our 7-gallon brew pot and a strong propane burner. The house lobster pot can steam 3 two-pounders, maybe 4. You can probably find a place in Wellfleet that will supply hot, cooked lobsters. The new owners asked us for notes for improvements, and we’re sure they will take an active interest.